Browse Lakes for more articles like this. Lake Buchanan anchors the Highland Lakes chain as the largest and northernmost body of water. With 22,333 acres of water, Lake Buchanan’s remote area is fantastic for nature and fishing enthusiasts. Known as a fisherman’s lake, Lake Buchanan is filled with people casting lines from their boats for largemouth bass, catfish, white bass, and hybrid striped bass. Hybrid striped bass are the most popular fish in the lake, mainly because they are restocked every year. Take some of the guesswork out of your fishing trip and listen to local fishing guide Clancy Terrill give his weekly fishing report. The Lake Buchanan Conservation Corp. provides GPS fish attractor coordinates with the depth of each brush pile when you type in the current water level. Unlike Lake LBJ, where the water level is near constant, Lake Buchanan varies dramatically from year to year because it’s one of two reservoirs in the Highland Lakes (Lake Travis is the other). In 2013, the lake reached a near-record low of 985 feet. Heavy rains in 2016 brought it back to full capacity for the first time since 2008. After a heavy rain, floating driftwood can be a hazard. That paired with often-choppy water conditions means Lake Buchanan is not the best option for recreational water sports such as wakeboarding or skiing. Besides fishing, people escape to Lake Buchanan for plenty of other recreational activities. 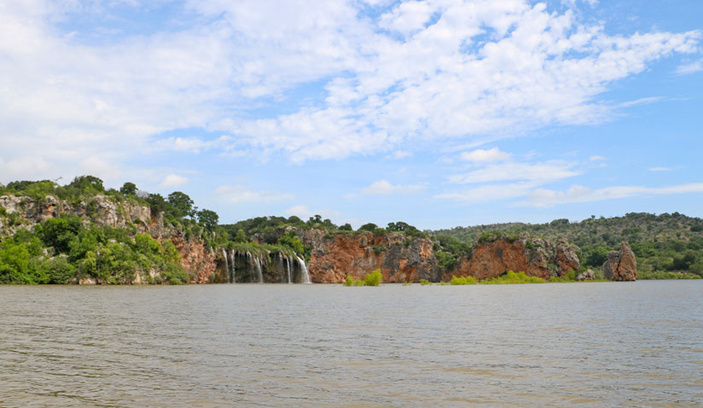 In a remote location on the far north end of Lake Buchanan is the Fall Creek waterfall. By boat, start at Cedar Point Recreation Area, 545 RR 3014 in Tow. After a bit of exploring through trees — drive slowly — you will discover the waterfall. Drop anchor and swim or just relax and listen to the sound of the waterfall. Cedar Point Recreation Area, 545 RR 3014 in Tow — At 400 acres, this Lower Colorado River Authority facility is one of the largest pieces of public land on Lake Buchanan and features 3 miles of shoreline. Hike, fish, camp, or watch wildlife. Overnight camping is on a first-come, first-served basis, and there are no fees. Go to lcra.org or call (512) 473-3366. Black Rock Park, 3400 RR 261 in Buchanan Dam — This 25-acre park has 18 mini-cabins for rent, RV hookups, and an events hall. Enjoy fishing and swimming. Llano County operates a small park with a boat ramp adjacent to Black Rock Park. Canyon of the Eagles, 16942 RR 2341 in Burnet — A nature resort where guests can get away from the hustle and bustle of daily life. Located on Lake Buchanan, the resort has sweeping views of the lake. The guest cottages are spread apart, lending a sense of seclusion under the tall oak trees. A glistening swimming pool invites guests for a dip after activities such as hiking and fishing. Take a cruise to see bald eagles, waterfalls, and an underwater city on a tour with Vanishing Texas River Cruises. From tours that take you to the hidden waterfalls to sunset cruises paired with wine, every choice presents the untouched beauty of the lake. Once the weather begins to cools in the fall, bald eagles migrate from the north to roost for the winter. Bring your binoculars because you’ll also set your eyes on ospreys, blue herons, egrets, and other beautiful birds along the way. Depending on the water level, you might get to see the Highland Lakes’s version of the lost city of Atlantis. When Buchanan Dam was built in 1937, the town of Old Bluffton was washed over and is now completely underwater. During low-water conditions, the town is revealed, including the foundation of the old hotel, the school yard, the gristmill, and the graveyard. Boat Rental: Call ahead to check availability. Thunderbird Resort, 200 Greenwood Hills Trail in Burnet — Rents a variety of watercraft, including pontoons and deck boats. Go to thunderbirdvacation.com or call (512) 756-4878. Splash Boat Rentals, 1924 RR 1431 in Kingsland — Rents ski boats with wakeboard towers. Splash Boat Rentals will deliver and launch on the lake. Go to splashboatrentals.com or call (325) 388-5000. Stay on Lake Buchanan: Stay on the lake at one of its many vacation rentals, resorts, RV parks, and camping areas. View dozens more places to stay on Lake Buchanan with our online Stay Guide.